This dune is located in the Souss-Massa-Draa area and is located about 50 km west of the rural town of M’Hamid El Ghizlane, itself located about 98 km south of the town of Zagora. 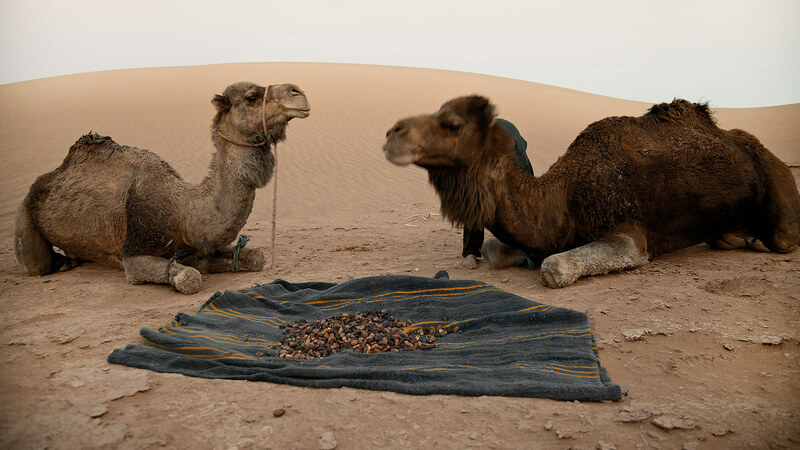 With a length of approximately 40 km to 15 km wide, it is the largest and wildest of Morocco. It is only accessible by 4×4, camel or on foot. An epic desert trek for 6 days/5 nights through some of the least visited parts of the Iriqui National Park, including the remote Erg Zahar dunes. 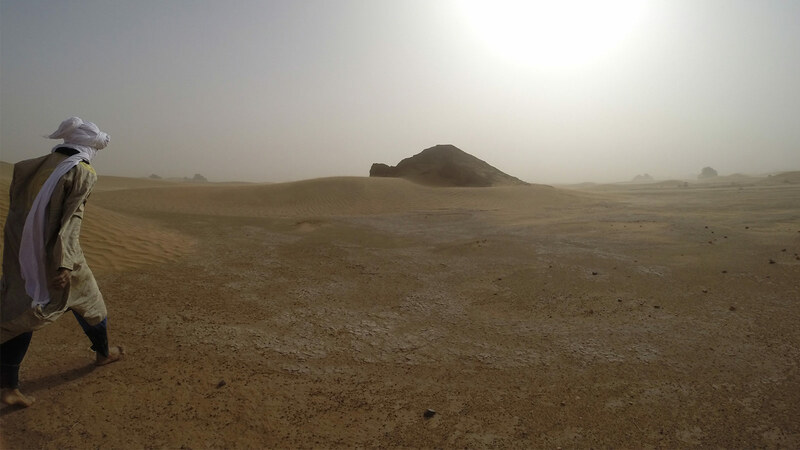 Dedicating 6 days to experience the Sahara desert allows you to truly switch off from civilisation. Emulate the nomadic existence. 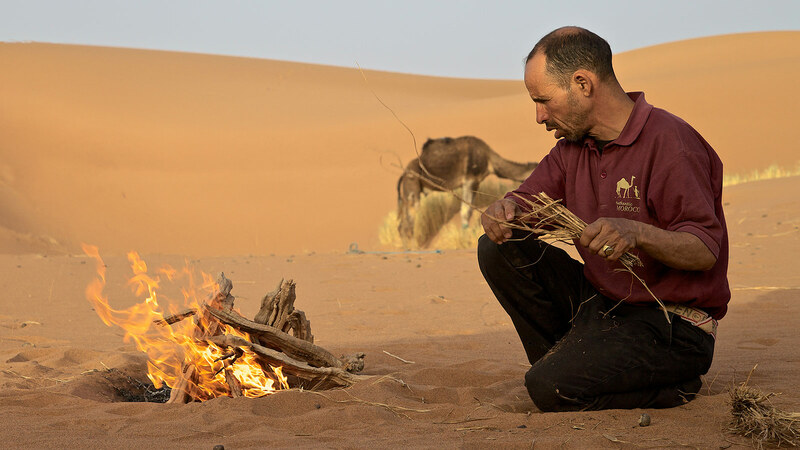 Relax in to the daily routine of the trek, and what we consider to be the luxuries of desert life; establishing wild camps, cooking on the fire, enjoying sunset & daybreak, the night skies and the natural wonder of the desert environment. The trek is a circular route that starts/ends at M’hamid. 4×4 transport in the desert is not necessary. 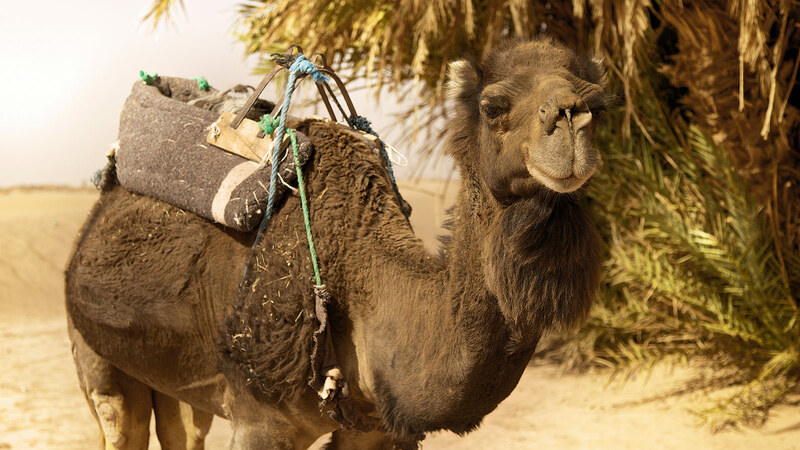 After breakfast, meet your desert guides & camel caravan when the camels are loaded with your luggage/equipment. Your guides will also help you to wrap your turban, ideal protection in the desert. The morning’s trek follows the southern banks of the Draa River, through the vast palm groves and original settlement of M’hamid (purported to be approx. 300 yrs old); take time to visit some of the ancient pise-mud buildings, now abandoned, and enjoy the partial shade offered by the trees. Once at the end of the palm grove, take lunch at a point known as Ras Nkhal. Here, the palm trees open out and give way to desert scrub and stone (hamada), earth banks & tamarisk trees for the rest of the day’s trek. After lunch, continue on a south-westerly course for approx. 2.5hrs towards the marabout (the shrine of a holy man) of Sidi Naji, close to where overnight camp will be established, in the seclusion of small dunes. Today’s trek time: 5-6hrs, depending on the pace of the group. After breakfast, camp is struck, and the day’s goal, the large, remote sand dune region, of Zahar, will be reached before lunch. Today’s trekking terrain is largely flat, plateau-like earth (a dried lake) which gradually transforms into rolling sand dunes, with far less vegetation visible today. Camp is established at the foot of the tall dunes, between smaller dunes, and lunch is served. This is a little-visited dune region and your afternoon is given to exploring Zahar, reaching the highest point to enjoy the wide-reaching views across the ‘erg’ (sand sea) and then the sunset. From this vantage point, it will be possible to look towards the route of the next day – the settlement at Erg Smar. Zahar is also known as the ‘screaming dunes’, for a legend that tells of a village buried beneath the sands there. Today’s trek time: 4hrs, depending on the pace of the group. After breakfast, camp is struck. 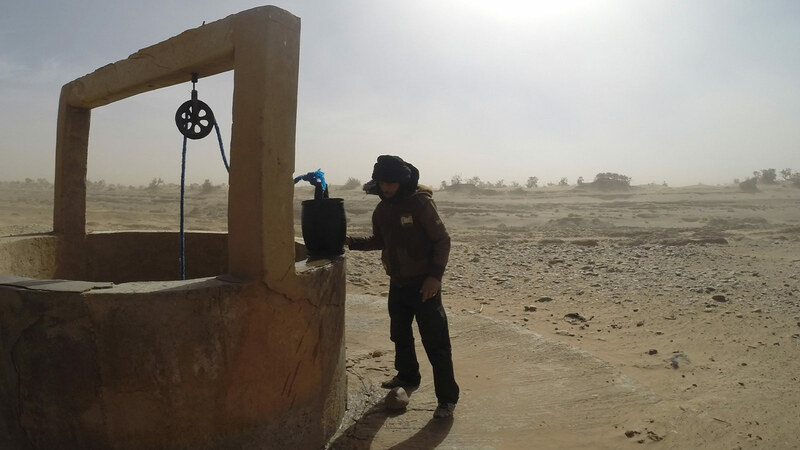 This morning, for the first time since leaving M’hamid, you will cross the bed of the Draa River, to its northern banks, to trek to the abandoned desert settlement of Erg Smar (where, once, up to 35 families lived and farmed the land). The size of the Draa river bed is astonishing, given it now runs dry, but once flowed in abundance through the desert. Water does still run deep underground here and there is a well on the banks of the dried river where you will replenish the water supply (and freshen up with a quick shower). Evidence of human existence is everywhere, the outline of agricultural plots & gardens, abandoned pise-mud buildings which were homes. 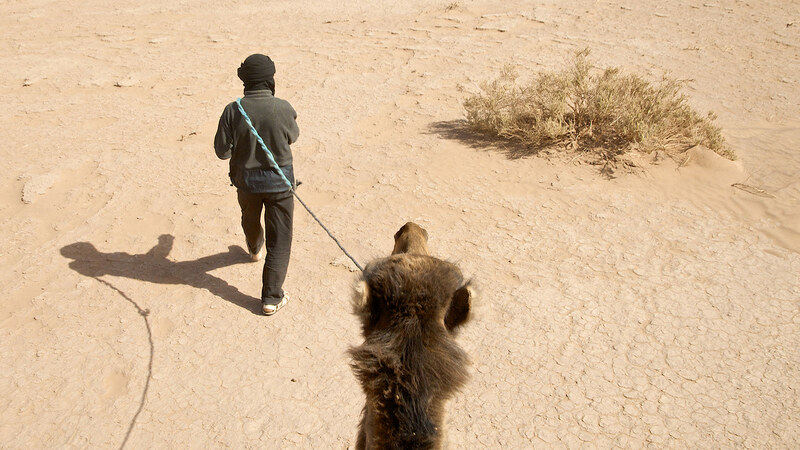 Your day’s trek finishes under the welcome shade of large tamarisk trees, where camp is established – hard to believe you’re still in the heart of desert terrain, given the size of the the trees at this village. After lunch, you may explore the settlement, the banks of the Draa and the sand dunes that have since started to encroach on the buildings. Today’s trek time: 3hrs, depending on the pace of the group. After breakfast, camp is struck. Today’s goal is the dunes of Bougarn, where you may come across other visitors for the first time on trek. Departing Erg Smar, you leave the dense vegetation behind to cross small dunes and then a broad, earth plateau, passing through an area where it may be possible to see traces of gazelle (as the shrub that they feed on grows just here). To the north and south, rolling dunes are visible. The vegetation increases once more, and you take lunch under the shade of trees. After lunch, on trek, continue through the vegetation and sand to reach a plateau before the rolling dunes of Bougarn rise before you. You leave the camels to scramble up the sand to the nearest vantage point. 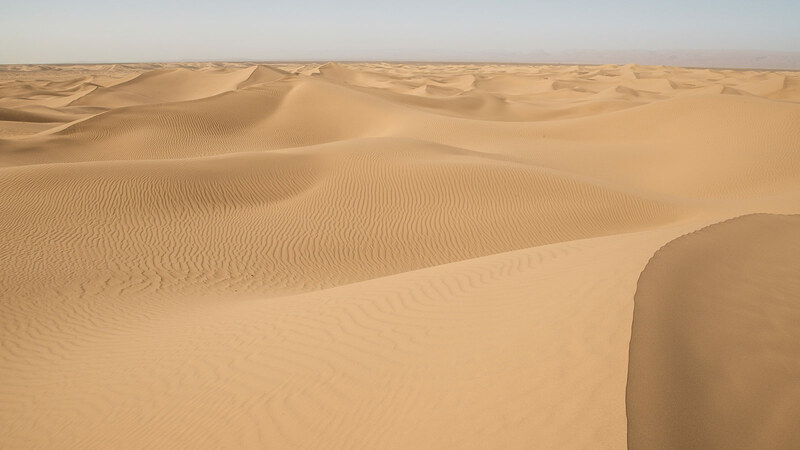 With good visibility, you should just make out the dunes of Zahar and of Erg Chigaga. 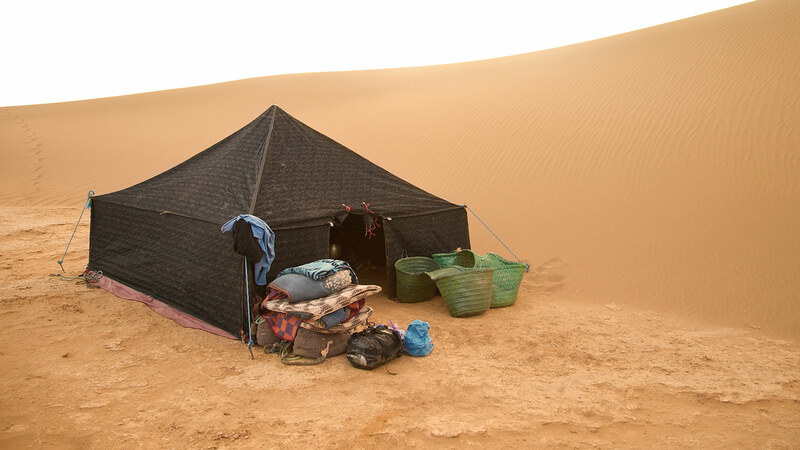 Camp is established in the shelter of small dunes. Today’s trek time: 5-6hrs, depending on the pace of the group. After breakfast, camp is struck. Today’s trek will see more vegetation, some lining the course of former river tributaries. Lunch is taken under the shade of the tamarisk trees. After lunch, trek across flat land which was once fertile (when water was present) and you will come across remnants of agricultural land which is now used as pasture for grazing camels. Overnight camp will be established, in the seclusion of small sand dunes. Today’s trek time: 5hrs, depending on the pace of the group. Today’s goal is the village of M’hamid, to complete your circuit. The terrain once more becomes marked by desert scrub and earth banks, and palm groves become more apparent the closer you reach M’hamid. You will break for lunch, in shade, before reaching the village. Today’s trek time: 4hrs, depending on the pace of the group.